Here's a little garden of daisy flowers. Some have lost petals, while others are just starting to grow. 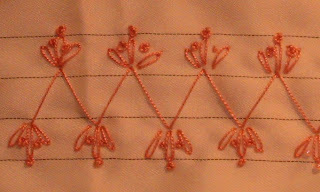 Start by stitching the zigzag, then the stems. Pay attention that each flower has a different stem height and two have smaller stems angled from the main stem. 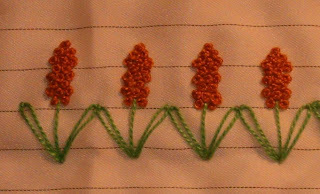 No beads are added, but if you've been following along...you know by now to add them to flower centers or to replace the French knots if you like. Changing the color of each flower or using variegated threads could be fun for these! 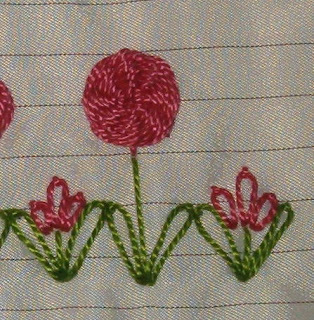 The basic dandilion flower at Stitch #31 was the starting point for this flower. It's a little different from the others we've been doing because the last step is to wrap the "spokes" to create the flower head. Stitch the base flower according to instructions in stitch 31 post...and the end result should look a little like a wagon wheel. Here's a photo of what I mean. Please note that there is a even number of spokes, which is not conducive with wraping...as any basket weaver will tell you. However, we'll overcome that. Once the base flower has been stitched, bring you needle up near the center...use the eye of the needle first instead of the tip when wrapping and you will not prick the thread. (in other words...back into the wraps). So, working in a clockwise direction: start with the nearest spoke...and go under it, then over the next spoke, under, over, under, over...until you get back to the beginning point. This is one round. Wrap you thread once around the starting spoke...and do the next round in the COUNTER-clockwise direction. Pay attention for each round that you are going over stitchs you went under at on the last round...and under stitches you went over on the last round. In other words, opposite TOP and BOTTOM threads will build as you finish the rounds. Use as many rounds of the over-under stitches as necessary to fill in the space of the spokes. After you stitch a couple..it gets easier, and makes a really cute little flower. My granddaughter is a great fan of flowers. She is five and comes to me often with a little budding treasure she has found. However, as most of them are dandilion flowers (usually just the head, as she sees no need to pick the stem...just the flower) they get a treasured spot on the kitchen counter ...for later disposal. 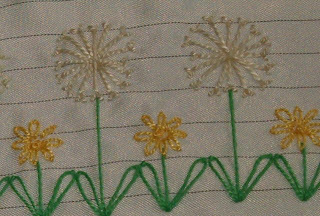 One of these little treasures got me to thinking about creating a stitched version of the dandilion seed pod and bright yellow flower. So, I stitched them both side-by-side and hope you enjoy the result. The seed pod sits on top of the stem, so make sure you leave room for it when putting your row of stems in. Begin the pod by stitching a vertical and a horizonal line intersecting the middle of both. (Each line should be about an inch long (1/2 inch top and 1/2 inch bottom). Heres a chart of what I mean. 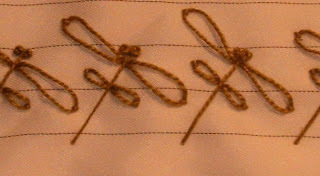 Now stitch two more lines in the shape of an X also intersecting at the middle. Lastly, stitch another "wheel spoke" between the spokes already made my the first two steps. Now that all the spokes are made for the seed pod, add two tiny straight stitchs to the end of each spoke. 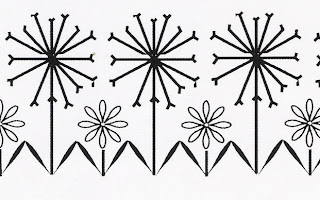 Complete the row of stitching with the lasy daisy stitched dandilion flower as the stitch chart indicates. 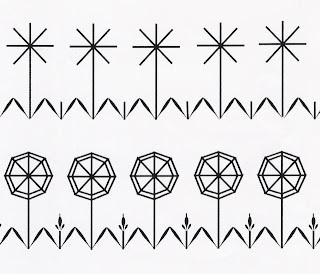 These have no beads, but certainly one could be added to the dandilion flower center nicely. Have been busy with round robin blocks lately. Currently, I'm stitching in four round robins (HGTV Forever Crazy, CQ International, CQ Sisters, CQ for novices)...and taking a class with Sharon B...and getting class handouts and supplies ready for two classes (CQ and shadow applique) I'll teach at our quilt retreat in April. And countless other things...like a special mermaid QC block just between a few friends! So, in a few words...I'm busy! Thought I'd share my CQ Sisters round robin efforts. The swap is a Jewel on Black (JOB) block. I was the first to work on Ardella block...and thought a be-jeweled Garden of Eden would be cool. 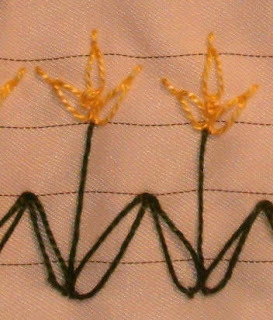 This is a little upside down thinking...as you have to do the daisy stitches from the outside into the stem. 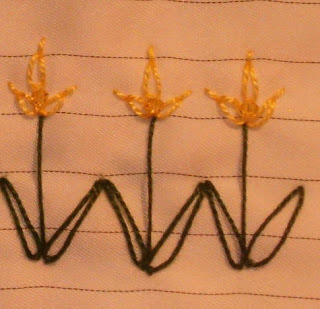 Add a little straight stitch to the "point" of the daisy to elongate the petals even more. Although this isn't like any flower I can think of...it reminds me of Spring somehow, and that makes me smile! Enjoy stitching it! We're not singing the blues with this little flower...but it is cute done up in such a cheerful color! 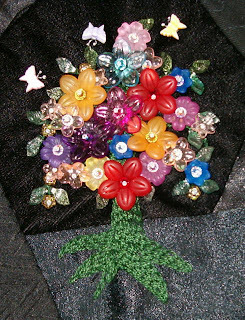 I like French knots (yeah, I know...that's pretty obvious by the amount I use)...but the crystals make nice little tops to this flower as well. If you want to change it up, put the petals closer together, and add two more right down the center over the stem. The result looks like a little mop head! If you elongate the stem and leaves of this little flower, to about 3 times the length...you would have a very effective rendition of a cattail plant found in marshy areas. 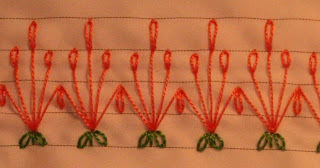 As it is, you still have a wonderful little border flower...not as "pointed" as Stitch #12 was, but very similar in style. 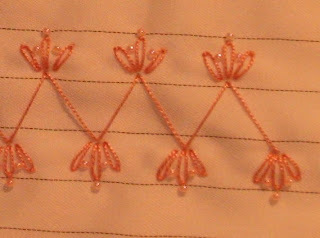 Here's a little stitch that is a good candidate for over-stitching ribbon. It is small enough to fit into tight spaces, but is still very special. 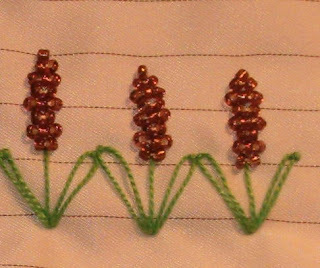 Replacing the French knots with tiny seed beads adds to the delicate nature of this stitch. 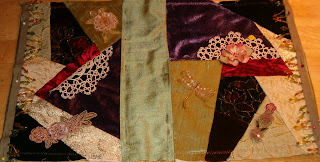 I've been working on Sharon B's Encrusted class offered at www.joggles.com and having a really good time. 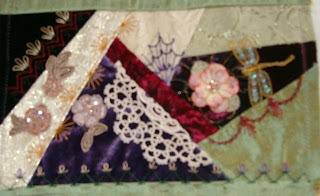 I have not had unlimited time to stitch on it lately...sadly...but, am trying to not lag too far behind in the lessons. Since I love to do things that I can use, I decided on a makeup bag instead of quilt block. Not sure this was a good idea, since each side is only about 9 x 11. I want to use beaded trim along the top (right below the zipper area)..so currently plan on adding a lot of beads to the seams and motifs. 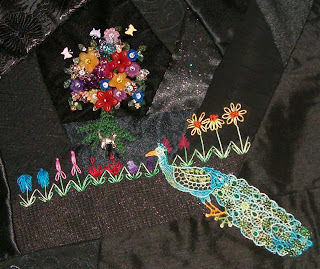 At present, I have some some seam stitching...to which I will add beads. And have "placed" some purchased motifs to see how they look. I want to do some Silk Ribbon Flowers on the tatted piece...and perhaps a ribbon bow across the piece...not sure. I played around with the motifs since my initial idea. Here is the whole bag, the green "stripe" is actually the bottom of the bag (it is laying sideways). Then, the next photo is the front panel with seam stitches...and last photo has the motifs as I think they'll be...but not yet stitched down. I'll keep you posted on the progress as the seams are each completed and SRE done. This stitch takes Stitch #25, and adds to it. 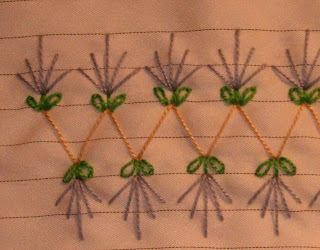 I could not get that little stitch out of my head for a couple of days, and decided to try adding some lazy daisy stitches to the ends of the limbs. While the three center stitches reach up...the lazy daisy stitches at the connecting points of the zigzag stitch point downwards. Again, I left off the beads, but if I stitch this in a block...I'll just have to add some 4mm crystals to the base of the limbs! 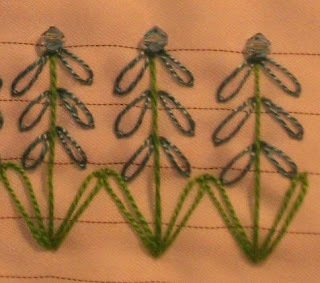 Here's a simple little fan type stitch...I was thinking of a low grass type plant. Very wispy...with foliage close to the ground...and the little limbs just reaching to the sky. I didn't add beads to this one, but of course they would just add another element. 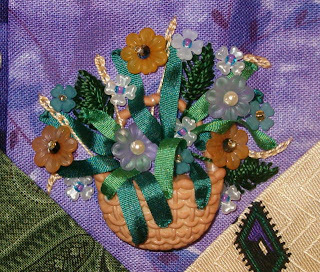 I also thought that some floral beads could e placed between the plants to add another layer of work. 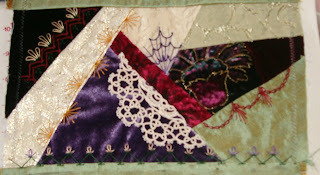 I just finished stitching on Marci's block as my part of the Round Robin group on Crazy Quilters International. 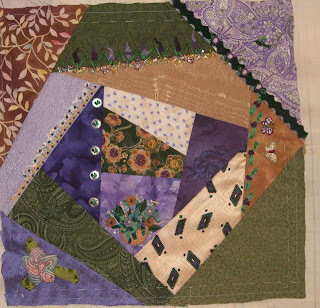 It was a really pretty block to work on, purple, tan, green, cream...very well constructed...and I truly enjoyed stitching on it. 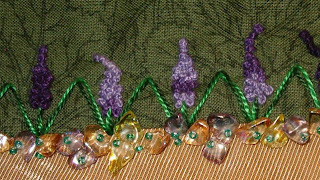 The green drew me to it first, and I had a piece of velvet rickrack that matched the colors beautifully...so stitched that down across one corner seam...and included some straight stitches, crystals, bullion roses, and a tiny hummingbird in flight. 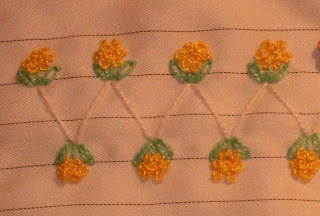 Then, include one of the TDiTM stitches...my favorite...lot's of French knots. Added some "rocks" at the base of the flower garden. Lastly, I decided on a mixed group for my motif. I had a little basket button...it was shank...but I cut the back off so it would lay flat. Then I got out the drill and put about 5 holes in the basket so I could end my SRE leafs right on top of the basket or a more realistic look. Added some embroidery "wheat" and padded leaves. Thought about SRE for the flowers...but I had recently gotten some really neat little flowers, and decided to use those...with some crystals, rocialles, and seed beads for a little more bling. This stitch is a little shorter than some in the past, and I really find I like it a lot. 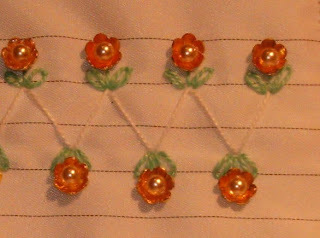 The beaded version used bead caps with pearl centers. I think it would be a great stitch to weave a ribbon under the zigzag...and that's what I'm going to do for my first seam in Sharron B's Encrusted Class block! Might do it twice, so I can use the beaded and un-beaded versions, I like it so much! For this stitch, I did not do any beads. 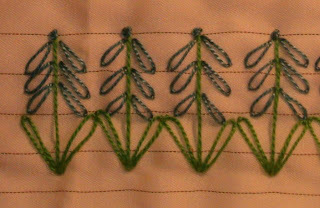 However, after finishing it...I think a bead added at the intersection of the straight stitches...above the leaves would be really neat! You might note that I'm not doing so much explaining on what threads and such...cause I'm lazy (translate that to busy), and have been using Perle Cotton sz 8 for most of these stitches lately, when that changes...I'll let you know. Reference: Twelve Dozen Stitches in Twelve Months Here's an unusual stitch for you...and one that has great potential. How about with black seed beads for eyes, or a string of seed beads and bugles for the tail? 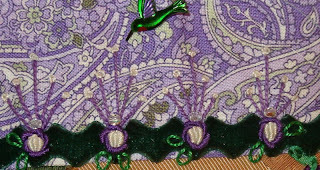 This little dragon fly is stitched using the jumbo template zigzag size...finally found a use for that! The zigzag only has the right slant stitch used...as the opposite side is not required. Of course you could alter and have the dragon flys slanted towards the left is you used that "back side" of the zig zag stitch for your base. No beads on this stitch...but they could be incorporated in the eyes and both...I just didn't think of that until I was well down the road past this stitch. Duh! This version is stitched in Perle 8, olive green.